Andreas Klamm Sabaot is a musician, music producer, journalist, author, song writer, keyboardist, artist and entertainer. He is also known as Andreas Klamm. Andreas Klamm Sabaot has produced and published five music albums with 12 up to 14 songs each and has produced and published 70 single music productions. The music productions are available on all known music stores such as Spotify, Deezer, Amazon, Google Play Music, Apple iTunes and many others. More information about the music and music productions of Andreas Klamm Sabaot will follow soon on British Newsflash Magazine. Andreas Klamm, (born February 6, 1968 in Ludwigshafen am Rhein, Rhineland-Palatinate, Germany) is a French – German – Tunisian broadcast journalist, author, news correspondent, reporter, editor, director, independent television, radio, film producer since 1984. He is also a music producer, song writer, singer, entertainer, artist, keyboardist, publisher, CEO and founder of several international and multi-national media. Andreas Klamm is also known as Andreas Klamm-Sabaot. He was a former student in nursing management in 2003 and 2004 with the Protestant University of Applied Science for social and public health care in the city of Ludwigshafen am Rhein, Rhineland-Palatinate, Germany. He has not continued to study because of special circumstances health related after several accidents and sickness which have taken the chances to contine to study. From 2013 until 2013 Andreas Klamm has studied journalism with SGD Studiengemeinschaft in Darmstadt (Hessen, Germany) and has received a degree as journalist. The journalist and author is a descendant of a French citizen and former French Army officer, Mr. Hedi Sabaot, born in Tunisia in North Africa which has been stationed in 1945 in the city of Kaiserslautern in Germany. His grandmother, Mrs. Marta Kolacz has left for political reason and because of persecution by people which have been influenced with the Nazi doctrine, in 1950 Germany for ever and has changed her citizenship from the German citizenship into the Australian citizenship. In 1950 Mrs. Martha Kolacz which has been in love and friendship with the French Army officer Mr. Hedi Sabaot has become in the city of Melbourne, in the state of Victoria an Australian citizen and has married in Australia another man, Mr. Joseph Kolacz from Poland, a former Security Police Officer (SP) which was working for the Polish Devision of the U.S. Armed Forces in Europe in 1945. Since 1984 he is traveling to other countries, such as Belgium, France, Spain, Scotland, Ireland, Wales, England and the United Kingdom and seeking co-operation for the radio and television productions with people from many different countries. 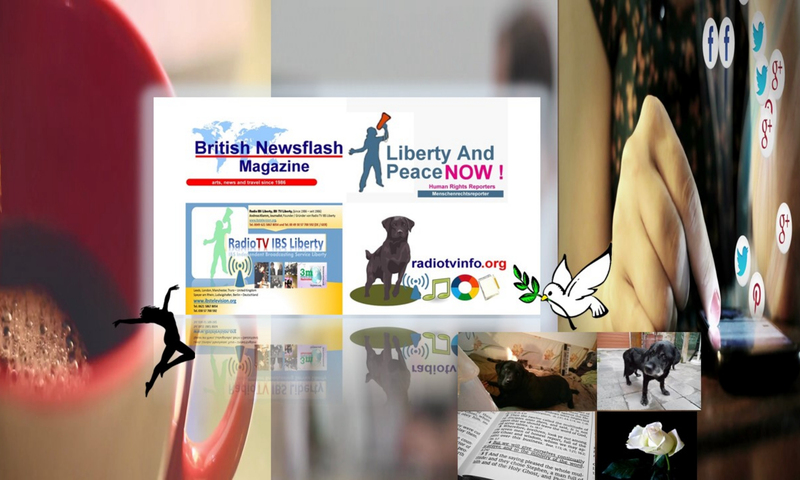 Media project Human Rights Reporter Liberty and Peace NOW! The international media project human rights reporter / Medienprojekt “Die Menschenrechts-Reporter” Liberty and Peace NOW! Human Rights Reporters has been founded in December 2006. For covering stories about more then 150 serious cases of abuses of the human rights the journalist has received again threats, as it happened already in the year 2000 after he has published a documentation on television. He is covering the stories about human rights issues with journalist from many different countries. In 1984 he has switched to write for the Daily Mail (Tagespost) in the city of Speyer am Rhein in Germany as known Tagespost Speyer (Reference: Tagespost Speyer, Archive, onlineuntil the year 2005. The newspaper went out of business and the journalist continued to write for the Morning Post, as known as Morgenpost Speyer until 2005. In 1984 he became also a producer of many different radio and television programs which have been aired on regional cable radio and television with the possible range of about 100.000 viewers on the regional cable television network. In 1984 he has founded the international independent 3mnewswire.org, which is providing independent news and information around the globe in the English, French, Spanish and German language. In 1986 the journalist and author Andreas Klamm became the founder of British Newsflash Magazine, which could be best described as independent news and travel magazine and got listed not only in many search engines but in the national directory for periodical the STAMM-Verlags-Verzeichnis, in Essen (listing of periodicals, international). British Newsflash Magazine is published monthly and available as PDF magazine and is providing several online editions on the internet. Already when he was 16 years of age he has produced a lot of interview with popular regional and even national politicians, such as Theo Magin, which used to be a member of the German Parliament. In London 2006 he has reduced his daily work load to “only 16 hours” work during a day. In 2007 he has covered as a journalist, news correspondent, broadcasting host of 3mnewswire.org, radio and television producer the G8 summit in Heiligendamm in Germany from the inside perspective taking thousands of photographs from the healthy and rich people and of the people which are called “rulers of the world…” . After he completly has served the entire forced military service with the German Air Force, for 15 months form 1988 to 1989, the author and journalist has written to the military council of the German Air Force and has requested NOT to be forced to participate any kind of war for the country of Germany as a solider in 1989 for reason of faith, believe, religion, political reason and of conscience. The German military council has refused to accept the request not to participate any kind of war. Since 1990 he is also a member of several unions, such as the former German union ÖTV, as known as Gewerkschaft ÖTV, which is now called Gewerkschaft / union ver.di.de, a member of the German union for Journalist as known as dju.verdi, Deutsche Journalisten und Journalistinnen Union, http://www.dju.verdi.de , a member of the International Federation of Journalist (IFJ), http://www.ifj.org. He is an affiliate with the World Association for Christian Communication (WACC) and member of several other organizations. In the early 90´s he used to be a board member of several other associations and media associations. In 1988 he covered a story about a refugee from former Yugoslavia which has been on probation for asylum in Germany, a father of several children and the German authorities wanted to send back the man to Yugoslavia although it was crystal clear that this will be a serious danger for the father of children. Andreas Klamm has produced an interview with press spokesmen and press spokeswomen and with the father which was in danger. The television program has been aired on regional public television. He got in trouble for speaking out a part of the truth and taking a stand in the public for refugees. In 2003 the journalist and author was diagnosed through his former physician with the possibility that he may suffers from cancer of a quite unusual kind. The diagnosis has not got proven but also no excluded. The search for a possible cancer is not possible because access to medical treatment and even access to dentists for the journalist is since 18 months not possible. This diagnosis of this physician has been not confirmed after four years. Andreas Klammis living and working under LOW- and even NO-budget conditions. The journalist and nurse (R.N., RGN) has stated in the public if he will not soon be allowed to leave Germany the danger that he might die, because there is no chance for medical treatment in Germany is great. He has also declared that he wants to see his medical doctor in London, United Kingdom. Since 2006 his place where he prefers to live is the city of London, as a 2nd choice as long he has to wait to get access to the United States of America. He prefers to live, work “…and to die as late as possible…” in the United States of America. Answering the question how is going to survive without the possibility of medical treatment of any kind or even without access to a dentist in Germany the author and journalist has answered: “…every day I have to pray before the Holy G-D of Israel and the Messiah…, some people, friends and even people which could be called enemies have been so kind to provide so pharmaceutical supplies or medication which I do need after three serious accidents which have happened in 1994, 1995 and 1996. In such very difficult times it is a real challenge to trust upon the Holy G-D of Israel and the Messiah that HE will take care of the certain needs. If I would not have the faith and believe that the Holy G-D of Israel and the Messiah do exsist I would be already dead. This is not about religion, this is a statement in concern of faith and believe. For some reason I do believe that religion can not save a man or a woman. Through grace I do know that faith and believe can save a woman or a man. British Newsflash Magazine erscheint seit 1986 in deutscher und englischer Sprache. Neben Online-Ausgaben ist British Newsflash Magazine auch in Ausgaben als Buch erhältlich. Die Allgemeine Erklärung der Menschenrechte wurde im Jahr 1948 durch die Vereinten Nationen in New York City in den Vereinigten Staaten von Amerika proklamiert ( = verkündet). Rund 62 Jahre nach der Verkündigung der Allgemeinen Erklärung der Menschenrechte leiden in vielen Staaten und Ländern immer noch Menschen, weil die verkündeten ALLGEMEINEN MENSCHENRECHTE nicht eingehalten, beachtet und mit Leben erfüllt sind oder die ALLGEMEINEN MENSCHENRECHTE von Menschen durch verschiedene “Interessens-Gruppen” verletzt werden. Die Allgemeine Erklärung der Menschenrechte kann sehr gut als internationale Grundlage auch für die internationale Arbeit von engagierten Menschen dienen. Die Allgemeine Erklärung der Menschenrechte ist auch als Resolution 217 A (III) bekannt. Jeder hat Anspruch auf einen wirksamen Rechtsbehelf bei den zuständigen innerstaatlichen Gerichten gegen Handlungen, durch die seine ihm nach der Verfassung oder nach dem Gesetz zustehenen Grundrechte verletzt werden. British Newsflash Magazine wurde im Jahr 1986 von Andreas Klamm, Journalist, Autor, Schriftsteller, Radio- und Fernseh-Produzent als internationales Reise- und Nachrichten-Magazin in deutscher und englischer Sprache zur internationalen Völkerverständigung gegründet. British Newsflash Magazine erscheint in gedruckter Form, im PDF Format und auch in Buch-Ausgaben und eBook-Ausgaben periodisch bis zu viermal im Jahr seit 1986 in englischer und in deutscher Sprache.